Except Christmas and New Year's Eve. - Children under 3 years free of charge (without bed and meals) Review: Personally we were with his wife and children at the Terme and we can only recommend. Water: Excellent !!! Even drugs because there were once baths. Small and friendly hotel in the quiet countryside. The pools nice thermal water with a temperature of 36.5 ° C, great for joints and body heating. Likewise, pearl and whirlpool nice. Meals were very tasty, although not a great choice because it can only be in large hotels or spas, but we were very satisfied. Peter and Paul Sorgerovci. The price for 1 person includes: - 2 x accommodation in double rooms - 2 full board - breakfast and dinner buffet, lunch buffet, served three-course menu (soup, main dish, dessert) is available free of charge šalátobar - welcome drink - unlimited entry to the hotel spa (thermal bath, sauna, Kneipp) 8:00 to 22:00 hrs. - 1 x 20-minute back massage for men • 1 x 20 minute face massage for ladies · 1 x daily jacuzzi gratis - late check out ... plus ... - bathrobe in the room - Included parking (car park with CCTV) - free of charge wi-fi access throughout the hotel - table tennis, darts and billiards - for free - table football, table hockey - for a fee Check in 14.00 hrs. Check out until 12.00. Supplements: - local tax € 0.70 / person / night - Surcharge for unoccupied bed in a double room € 17 / night - Apartment € 15 / night - family room € 28 / night - Surcharge for a pet € 7 / night (the hotel has reserved a number of rooms designed exclusively for guests with pets) - cot € 4 / night Hotel Terme is located in the beautiful surroundings of Banská Hills in Vyhne, 12 km from Banska Stiavnica. Directly below the hotel is also known Vyhne Water Paradise . forges were previously spa incurred by miners digging in the mine encountered the hot spring water that contains iron. In the past, they were treated at the spa various important personalities. The spa was known as the Second World War, when they were already destroyed and they could not be recovered. 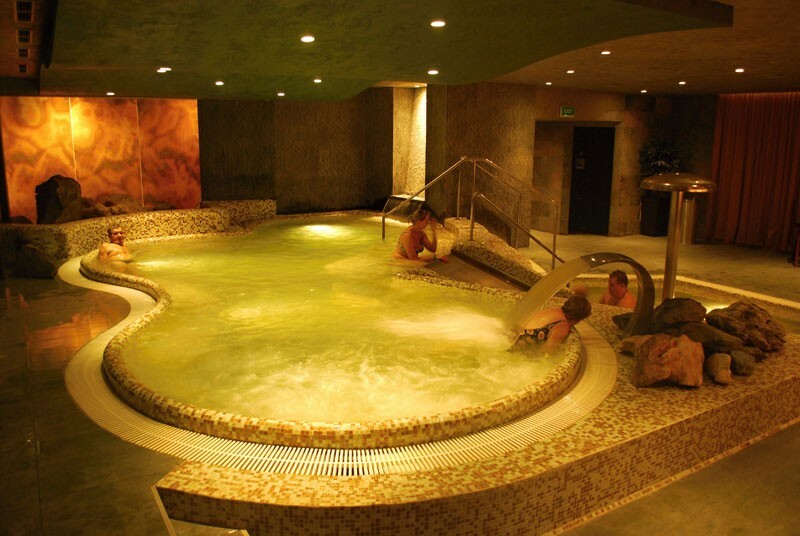 The medicinal spring today fills pools of Termál Vyhne, where you can recuperate and regenerate your body. Warm healing water in the pools in the wellness has positive effects on: - skin diseases - gynecological diseases - rheumatic diseases - traumatic conditions - convalescence in heart diseases - postoperative states - the overall regeneration and mental fatigue newly renovated wellness: - Swimming pool with thermal water with a temperature of 36.5 ° C - one seat with a jacuzzi and a second smaller pearls 4 x 6 mentri, where you can swim a little - tepidarium - Jacuzzi for surcharge - Kneipp bath - dry sauna - steam sauna - skilled hand massage - small gym - billiards - darts new lobby bar and brasserie. From Bratislava - 166 km, 1 hour. 39 min. From Kosice - 247 km, 3 hours. 15 min. from Žilina - 107 km, 1 hour. 35 min. The new Baňou and Žarnovica City Bzenica is where you turn to avoid. 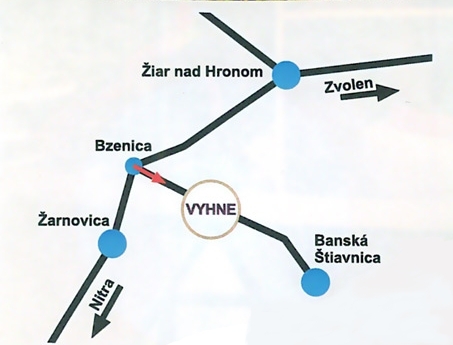 In the village Vyhne should be carefully monitored right turn, about half of the village, there are also directional signs not only for hotel Thermal, but also Sitno hotel, located next to the hotel Thermal. Osobne sme boli s manželkou a deťmi v hoteli Termál a môžeme jedine odporúčať. Voda výborná!!! Dokonca liečivá, lebo tam boli kedysi kúpele. Menší príjemný hotel v tichej prírode. V bazénoch príjemná termálna voda s teplotou 36,5°C, výborné na kĺby a prehriatie organizmu. Takisto perlička a vírivky príjemné. Strava bola veľmi chutná, nebol síce veľký výber, lebo to vie byť jedine pri veľkých hoteloch, či kúpeľoch, ale my sme boli veľmi spokojní. Peter a Paula Sorgerovci. Deti majú v cene pobytu ubytovanie a stravu (bez procedúr). Platia sa namieste pri príchode na recepcii. Možnosť zabezpečenia špeciálnej stravy pre alergikov (bezlepková, bezlaktózová a pod.). Nutné nahlásiť pred nástupom na pobyt. V prípade štandardných diét bez doplatku. V prípade nadštandardných požiadaviek doplatky riešené individuálne. Doplatok za nadštandardné požiadavky 3,00 € / raňajky alebo obed alebo večera / osoba alebo podľa náročnosti požiadavky. U polpenzie výmena večere za obed nie je možná! WELLNESS CENTRUM OTVORENÉ DENNE OD 08:00 DO 22:00 hod. MIMO SANITAČNÝCH DNÍ. Parking: Parking is located next to the hotel and is guarded by camera system and charge.